Live within your means. Stick to a budget. Live sustainably. Spend prudently. So many catch phrases urging us to keep our consumption within the limits of our resources. For Californians, to ‘live within our means’ requires adjusting our lifestyles to reflect the reality of water scarcity. Here in the Sacramento Valley, we just finished the driest year in recorded history. The source of virtually all of our water, the snowpack of the Sierra Nevada mountains, contains a paltry 1/5 of the average amount of water. In January, typically the wettest month of the year, we’ve seen no measurable precipitation. We always have a tenuous relationship with precipitation here. Our California standard of living depends on an ingenious water storage and delivery system of dams, reservoirs, and canals that has turned what would be a near-desert into an oasis. In ‘normal’ rain years, it takes scrupulous planning and coordination to balance human, industrial, agricultural, and environmental demands for water. In drought years, there is simply not enough water to go around. A profound change that we, as individuals, can make to move toward prudent spending of this precious resource, is to reject the landscape aesthetic of summer verdancy. The English countryside, the source of our American lawn-based version of landscape ideal, is summer green because . . . it rains in summer. 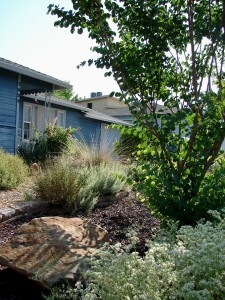 The native California landscape is adapted to thrive with no rain from June through September. It features a sequence of colors: the vibrant purples, yellows, and oranges of the spring wildflower show; the soft summer green of deer grass; the tawny tones of redbud in autumn, and winter’s flush of new green on the buckeye. It is looser, maybe messier, than the mown tidiness of a lawn-based garden. When we tweak our brains to accept this subtle native beauty as the ideal aesthetic for our own yards, we can move beyond contrivance of the lawn ideal. And start living within our water means. This entry was posted in Uncategorized and tagged drought, drought tolerant native plants, Live within your means, native landscape, prudent spending, summer drought native plants, sustainable gardens, water conservation on January 24, 2014 by admin.